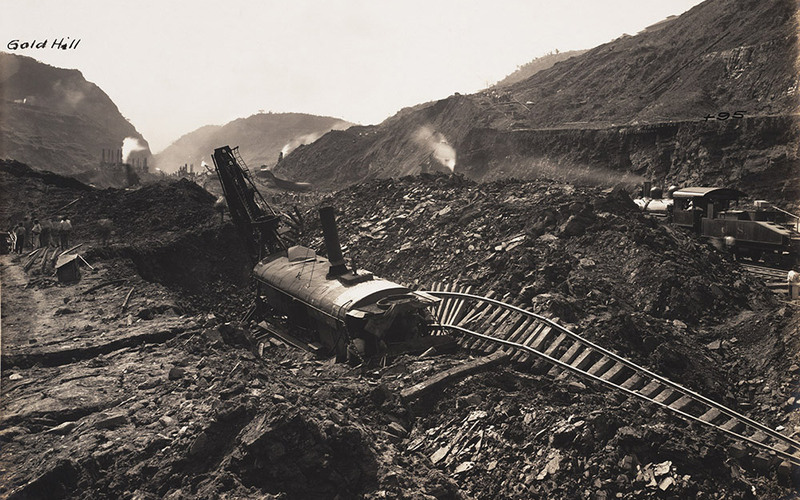 Steam shovel #258 and loaded flat cars caught in a slide at Culebra, May 29, 1913. Huge landslides, mainly in Culebra Cut, confounded Canal engineers. The slides were of two types. Gravity slides were caused by porous, saturated material sliding down slopes of firmer, more impervious rock or clay. Deformation slides were caused by unstable rock brought down primarily by overly-steep slopes. Not only did slides dump millions of cubic yards of material back into the Canal, some slides created bulges that pushed up material from below the bed of the Canal. As the Cut deepened and the slopes grew steeper, the slides grew larger and more frequent. The only remedy was to excavate a wider channel and make the slopes less steep. Millions more cubic yards would need to be cleared from the slopes. Buildings at the town of Culebra threatened by slide. Though most landslides crept slowly into Culebra Cut, they could sometimes come without warning and bury men and equipment. The screams of accident whistles brought workers running, heading onto risky ground to try to dig out workers that might still be alive. 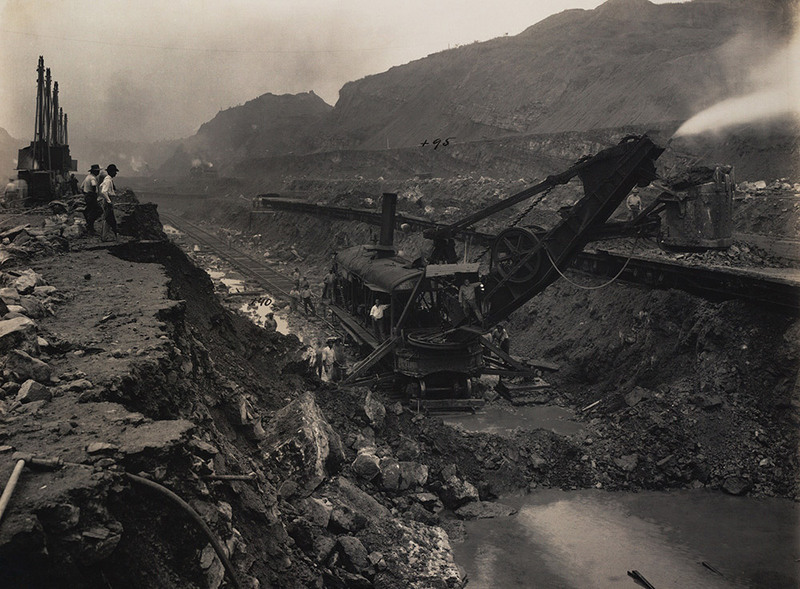 Steam shovel #201 sits amidst upheaved material, February 6, 1913. 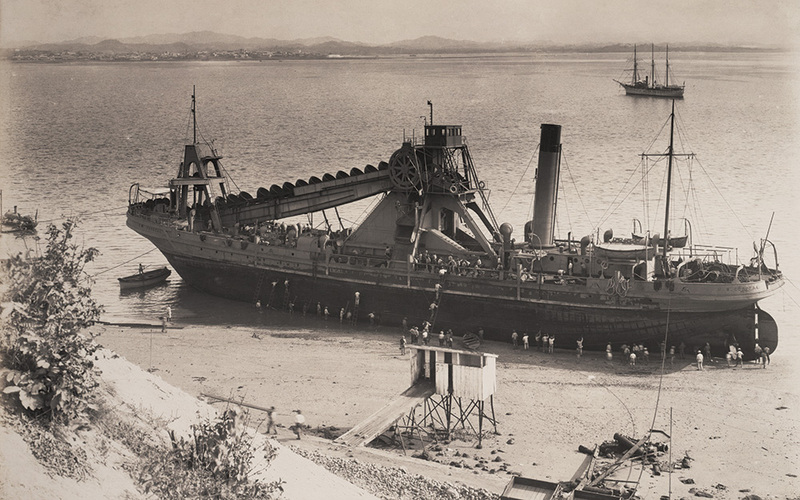 The 269 foot ladder dredge Corozal beached for repairs, June 1912. Searching for survivors after a premature blast at Bas Obispo that killed 26 and injured 49 men, December 12, 1908. Slides were not the only danger. 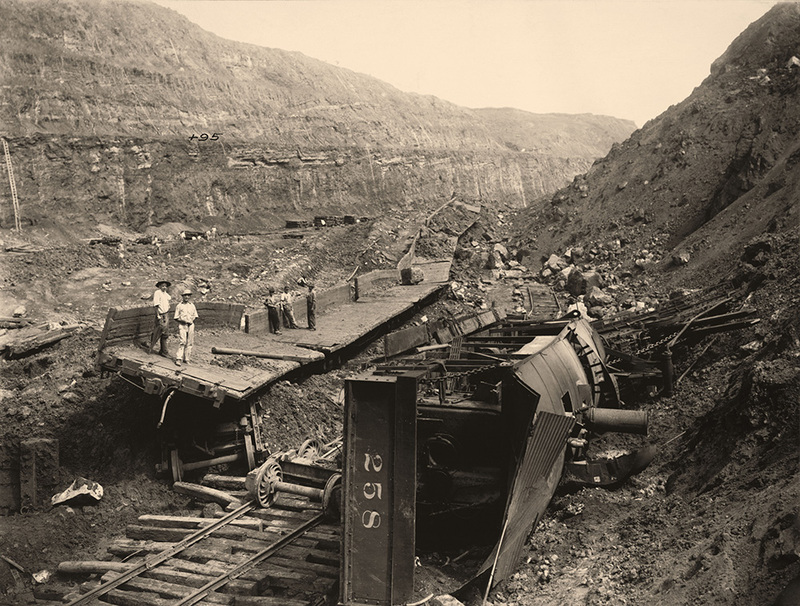 Racing trains, swinging cranes, explosions, drowning, and falls from scaffolds were just some of the ways a man could die or be maimed at the Canal. Surrounded by the noise, dust, and smoke from locomotives, steam shovels, blasting, and hundreds of rock drills, staying alert was not easy. 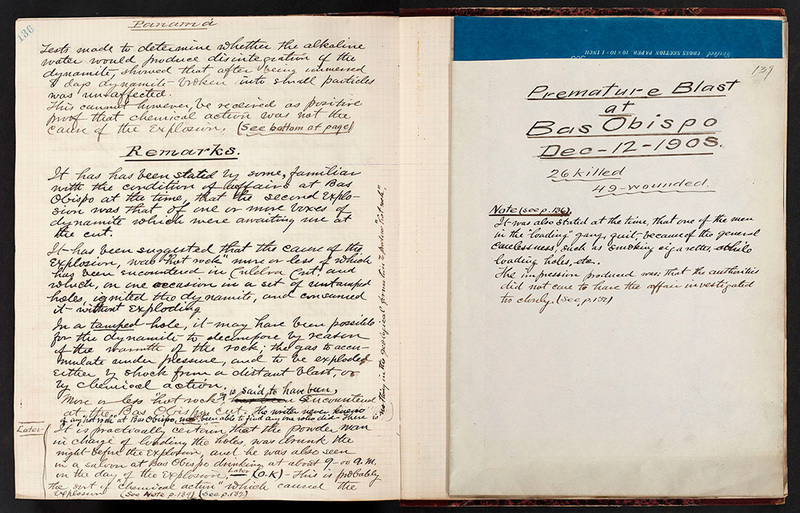 Working with explosives was one of the most dangerous occupations on the Canal. Chief Engineer Goethals blamed the frequent accidents on worker incompetence, but explosives could become unstable because of the climate, lightning could ignite a blast, and steam shovels sometimes hit unexploded charges. A phenomenon known as “hot rock,” caused by sulfurous blasts of hot air from iron pyrite oxidation or water vapor from moving rock, could also ignite charges. Or, there might be no satisfactory explanation, as was the case in the worst accidental blast at Bas Obispo in 1908 that killed 26 men and wounded 49. A.B. Nichols comments on the cause of the Bas Obispo blast. Letter to A.B. Nichols from W.L. Thompson, the engineer who had inspected the preparations for the Bas Obispo blast. 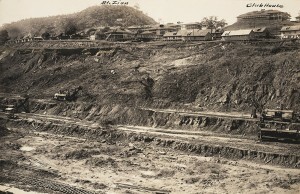 Dredges continue to work at clearing the Cucaracha Slide, January 28, 1914. Records from the American period of construction document 5,600 deaths, of those, 350 were white Americans and 4,500 were non-white, mostly West Indians. However, the number of West Indian deaths is likely underreported because many lived in the cities outside the Canal Zone and some causes, typhoid fever for example, were not always included in the statistics. *Title of a popular work song of the day. Workers gather around steam shovel #222 after completing bottom pioneer cut in Culebra Cut, May 20, 1913. 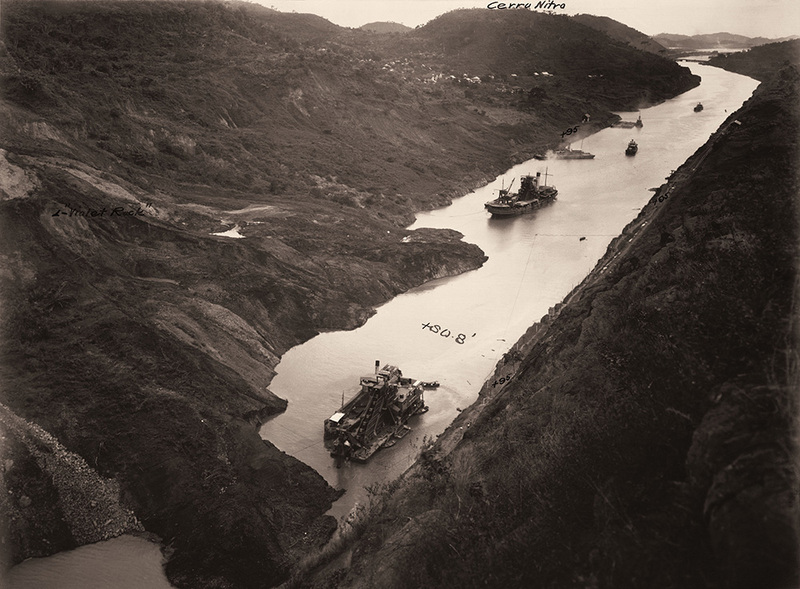 The old French dredge Marmot and the dredge Corozal at work in Culebra Cut, December 3, 1913. 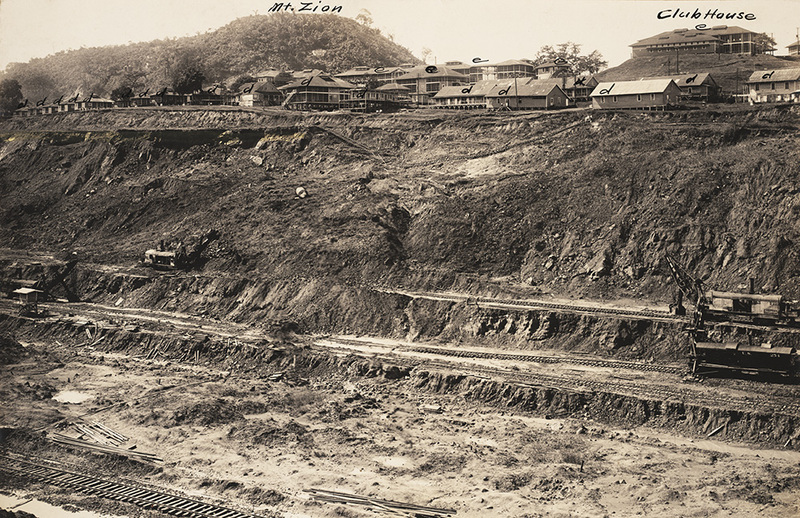 Though excavation at Culebra Cut was “finished” in May 1913, a slide at Cucaracha still blocked the Canal. 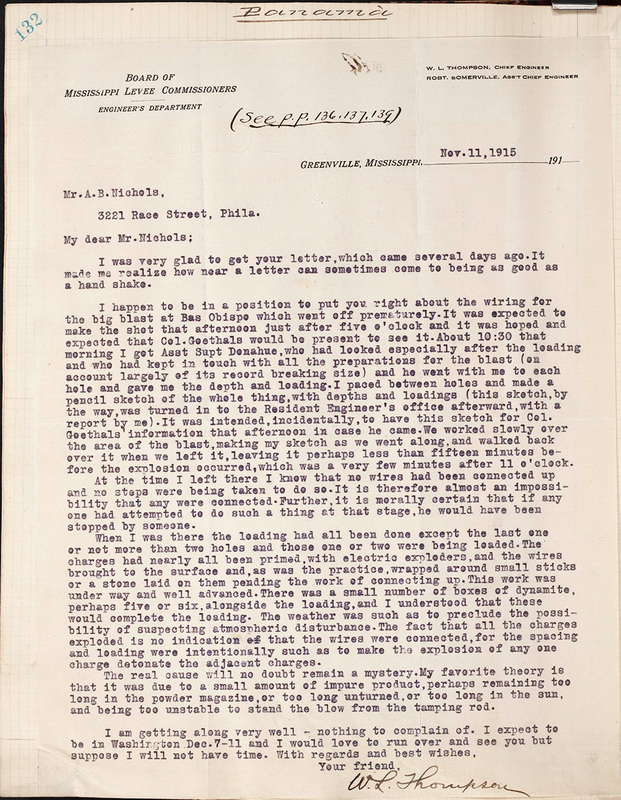 Chief Engineer Goethals decided to release water from Lake Gatun in October 1913 to fill the Canal and use dredges to clear the slide.